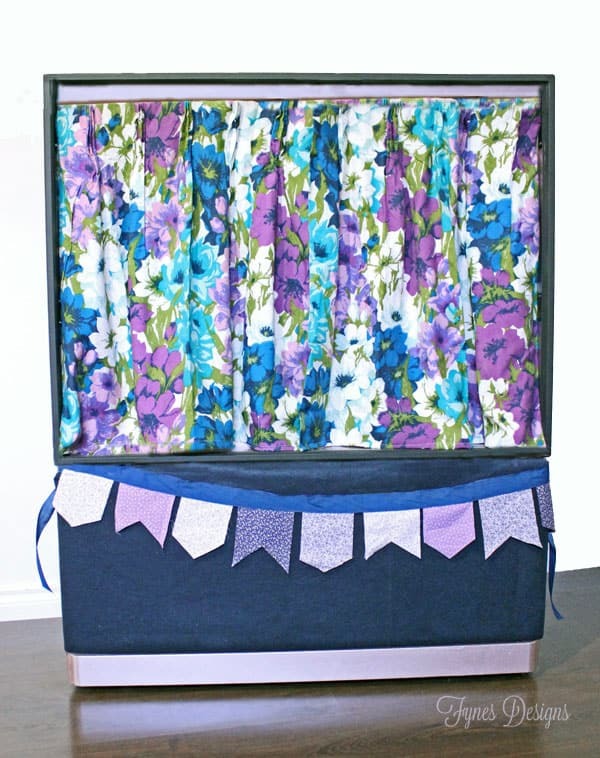 DIY Puppet Theatre From an Old TV…with BIG Shine! We acquired an big screen TV a while back from friends of the family to use in our basement. Unfortunately during the move the mirror in the back got cracked which left us with quite terrible picture quality! Since it was so huge we neglected to turf it for quite some time, which turned out not so bad because it made a great puppet theatre! I wanted the puppet theatre to be a bit glamorous so I set out in search of something with a little bit of shine. 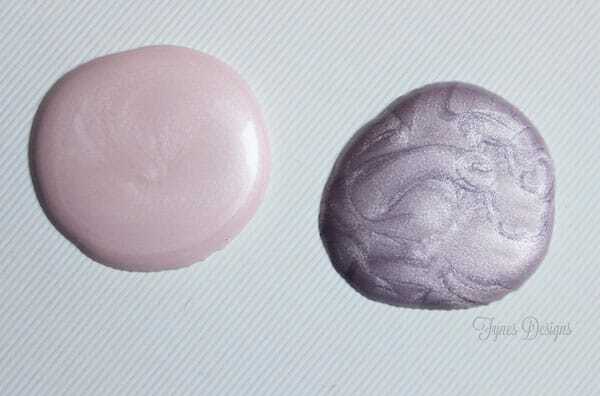 I thought about an ultra glossy paint but when I came across Modern Masters Metallic Paint I knew it would do the trick! Modern Masters has so many colors to choose from! I managed to narrow it down to Pink Pearl and Lilac, R’s favourite colors! Ever want to paint something large with nail polish? That is the best way for me to describe how beautiful this finish looks when its done (however capturing it on camera is terribly difficult)! When painting a large surface, you’ll need to use a tad of extender to avoid roller marks, but otherwise the process was just like using regular paint! 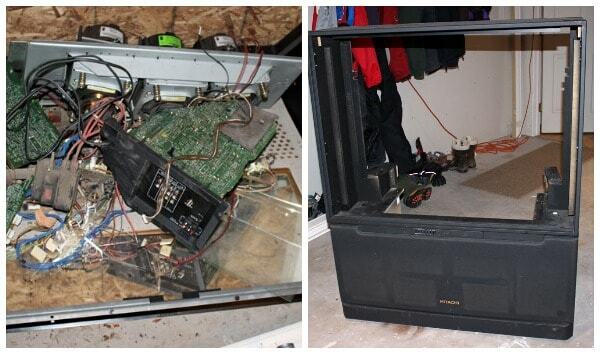 I first prepped the surface by applying a coat of 1-2-3 Bulls Eye BIN primer to the entire TV frame. When the primer was dry, I applied the first coat of paint. I was a bit worried because the roller created thousands of tiny bubbles that wouldn’t seem to go away. However, when it dried the paint was as smooth as a baby’s bottom, and looked perfect! To my surprise the dark color took only two coats for good coverage! Mr. Fynes added a 18″ board to the bottom of the picture hole for the children to hide behind. Looks sharp, doesn’t it?! I covered the speaker with a fresh piece of felt, and a small curtain rod for hanging the drapes. 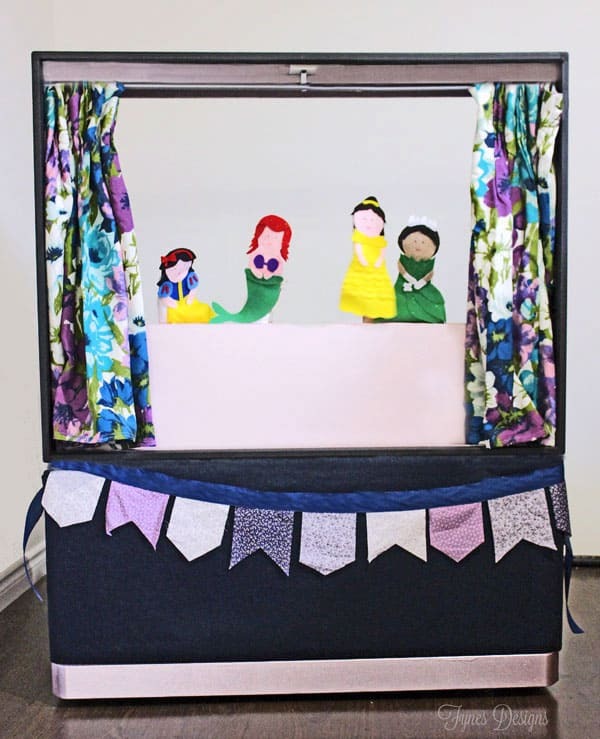 I made the bunting banner along the bottom to make it a bit more fun, but when the curtains open and the Princess Sock Puppets come to the stage the fun in our house off the hook! The puppets kinda steal the show, but what do you think about the Metallic Paint? I LOVE the shine! Since I ordered way too much paint, and it just so happened to be the perfect pink for a Valentine’s Day project I whipped together these wooden conversation love hearts! This metallic paint from Modern Masters really works great to give shine to big or little projects! 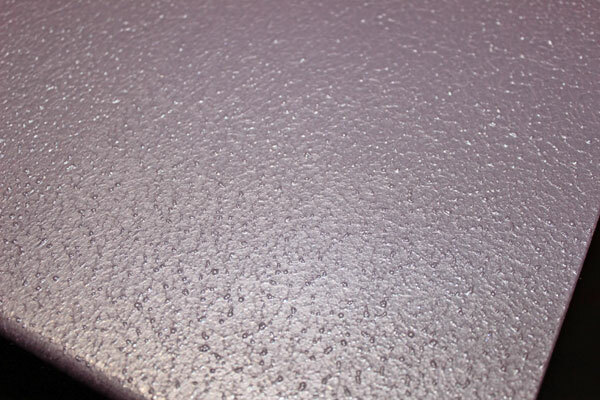 What would you use metallic paint for? Check out this Patio Furniture from A Nest for All Seasons, and this Bathroom Nook from The Benson Street for more inspiration. That is SO clever! 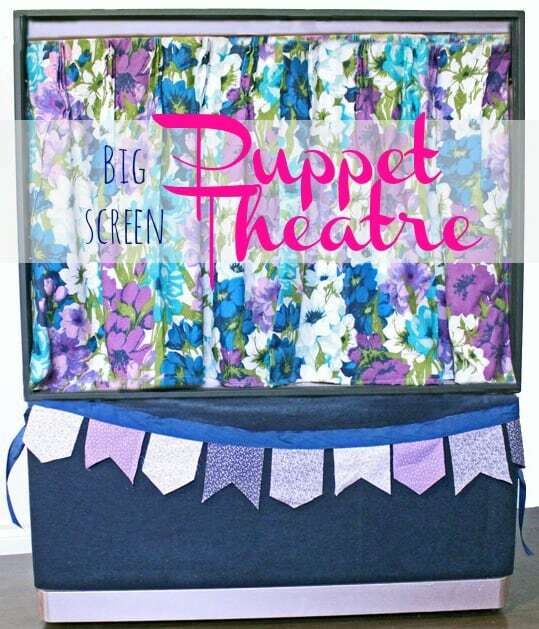 When I was a kid, my dad made me a puppet theater out of wood and I had so much fun with it. Never would have thought to use an old TV! And that paint is beautiful!!! I’m so impressed how the paint turned out, it actually very durable! Such a clever awesome Idea! Thanks for sharing! This turned out amazing! !….u always manage to amaze me with what u come up with!! !gonna have to get me some of that paint my princess would love everything in those colors!!! I just love it Virginia!! I actually have an old tv laying around! I didn’t realize you could paint them with metallic paint. Thanks so much!! I love this, Virginia! What a clever repurpose! Do your kidlets love it? oh man, my kids LOVE it! I’m almost puppeted out to be honest! And here I am staring at my old picture frames going what do I do with these and you guys rocked that TV!!! What a great idea! Leave it to you to transform an old clunker into something so fab. Love it! I just threw out one of those monsters last week! Who knew what you could make out of it. Such a great idea for kids and beautiful colors! What an adorable idea! The paint colors are so pretty! 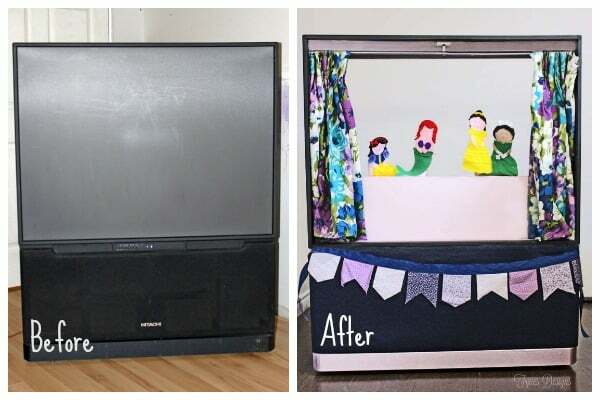 Love your upcycle of the TV! The metallic paint is really tempting – what other types of colours does it come in? Holly is comes in so many colors I couldn’t count! The #modernmasters link will take you to the color selections. So many beautiful ones! Thanks for coming back Laura! My kids are loving it and are having so much fun! I never thought of the signs for anything else, but wedding decor is a great idea!